I’m fascinated by the saggy pants look. So fascinated that I am determined to try it out one day. I’m not as impressed by those who follow the first and third examples in the illustration to my left as I am with those who go all the way, as depicted by the model in the middle drawing with the pant hanging especially low below the waist. I call the lowest low-riding pant fashion the “sagsagsagsag,” said with emphasis on the second syllable. Man protests the sag moment with his bold anti-sag attire while holding tea kettle at tire store. I can empathize with men who choose this bold fashion statement. I, too, have had to wear the sag look for most of my life, though no one would think I dress that way because it looks like my pants are around my waist – maybe even a little higher than that. I want to blend in. It just so happens that my legs make up 80% of my height. This means if I were to pull my pants up all the way to my hip bone, I would look like the good gentleman here to the right. Little did they know in 1992, a saggy pants trend would dominate a segment of the male fashion industry over the next two decades. When in history has a pants-wearing trend endured for that long? How much longer can it continue? On the same day a few weeks ago, I saw several men in different locations with the sagsagsagsag look. It made an impression on me. I was struck that these men were not content with the mere sag looks made famous in 1992 by pre-teen hip hop artists Kriss Kross. These days, men go all the way – absolutely as low as (they think) they can go, which is impressively low, just above the knee cap. In my observations, I have found that a belt is needed to keep the pants in place. The placement of the belt appears to make it difficult to walk quickly. Is this similar to the difficulty a woman might have walking quickly in a skirt? The deeper question: Is the fashion of both sexes’ beginning to mesh into one? A prominent myth circulating about the origin of the saggy look is that it began in prison to either send certain sexual signals or it was the result of oversized prison wear. I call it a myth because I believe the good folks at Snopes who have been debunking these claims for a decade. There is only one reason why a man would dress this way – only one. He believes he looks good with some saggy pants action. When I try it next time I go to the mall, I know I will look good, too. 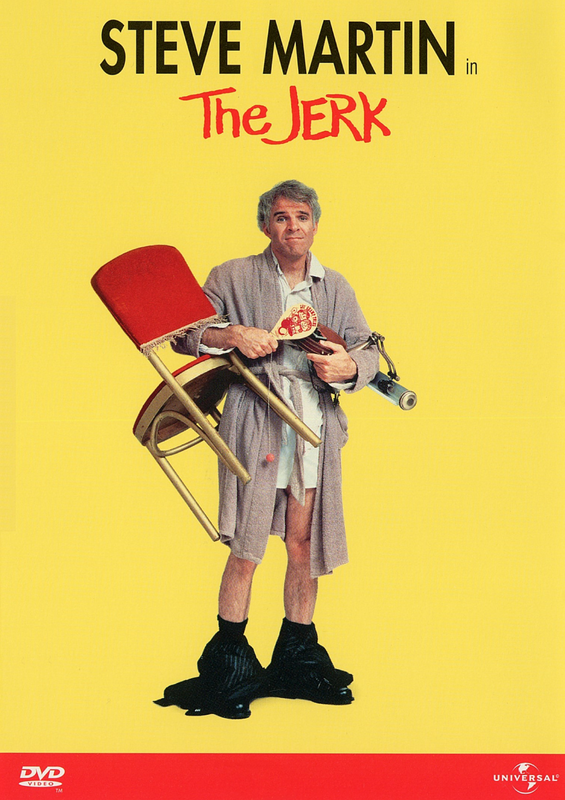 Pants worn around the ankles, à la Steve Martin in The Jerk. The only difference between Steve Martin’s look in 1979 and the future look of 2015 is that the legs will continue to be covered. Shirts will go down to the knees and boxers will descend below the ankles, into the shoe. It’s time to invest heavily in textiles. The ultra saggy look will catch on by the masses in 2017, ending abruptly in 2019 when the cost of denim decreases dramatically during full implementation of the Trans Pacific Partnership, creating more demand for full length jeans. In 2027, the ultra saggy look will re-continue, though it will be picked up mostly in rural areas. The style won’t make a comeback to trendy urban areas until the mid-40s. Whatever the future may hold, and it will, Steve Martin should be credited for blazing the path for the sag revolution way back in 1979. Look more closely at the diagram of the three enterprising young men whose knickers (careful) sag. Though the third one appears to sag one sag unit less than the middle, the pants themselves are actually just as low. The difference is the underwear height. The young man in the middle is wearing his underpant at full mast, while the third young man is wearing it at half mast, thus exposing some of his hindquarters.